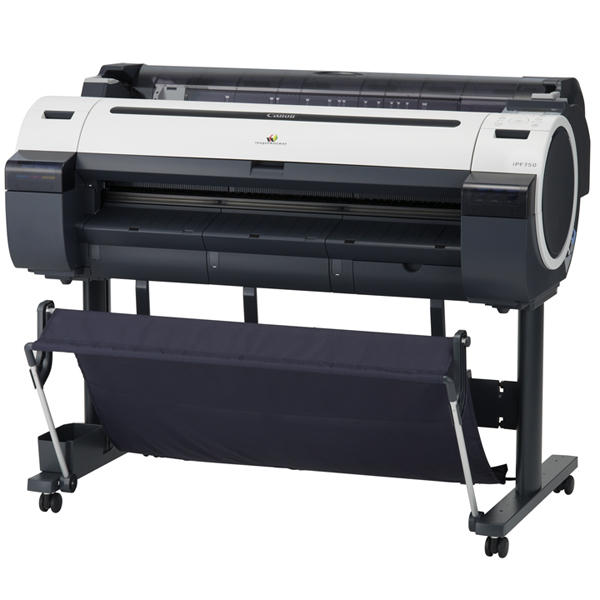 The Canon imagePROGRAF iPF750 is a large format printer designed to produce extremely large documents - as wide as 36" - at high resolutions and at high quality in both black and white and in color. The iPF750 measures 41.8" by 51.3" by 34.3" and weighs 139 lbs. 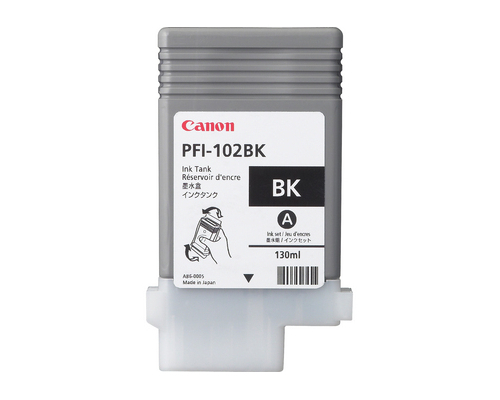 It will more than likely require its own stand, which Canon includes, given its extremely large size, heavy weight, and the fact that transporting it or feeding large documents when it's in a cabinet or credenza may prove extremely frustrating and undesirable. The printer has a total of 15360 nozzles spread across matte black, cyan, magenta, yellow, and black inks. The matte black has 5120 nozzles and all other inks have 2560 each, and the printer includes a non-firing nozzle detection and compensation system in order to ensure that clogged or otherwise non-working nozzles have their spaces filled in by other, working ones. The imagePROGRAF iPF750 produces documents at a maximum resolution of 2400 by 1200 dpi. It supports media widths between 8" and 36" for cut sheets and 10" to 36" for roll feeds. It can process rolls as long as 59' printing to a roll feed and 63" for a cut sheet, and a maximum media diameter of 5.9". When using the front loading manual feed, it can print to media between .07 and .8 mm thick. It can print to vellum, economy bond paper, universal bond paper, high resolution coated bond paper, double matte film, matte coated paper, premium matte paper, and semi-gloss paper, satin photographic paper, glossy photographic paper, premium semi-gloss paper, universal glossy paper, premium glossy paper, premium RC photo matte, premium RC photo luster, heavyweight glossy photo paper and heavyweight satin photo paper. It supports roll paper, A0, A1, B2, and B1-sized sheets. Borderless printing can be done on 10", 14", 17", 24", B2, A1, A0, and 36"-sized sheets. The printer has a roll-feed that can process one roll at a time through its front output. A top loading manual feed allows it to feed one sheet through a front output, and the front loading manual feed can process one sheet, output through the front. A cassette can hold up to 250 sheets of letter or plain paper, output through the front. The printer's built-in HDI driver allows this printer to print directly to AutoCAD systems as interpreted by Canon's proprietary GARO language. The printer also supports raster imaging using HP's HP-GL/2 and HP-RTL print languages. The printer includes 256MB of RAM and connects to systems via USB 2.0 or 10/100/1000-Base TX Ethernet. Few office solutions offer Gigabit Ethernet, setting this model apart and making it a good choice for environments that have equipment capable of processing the higher throughput that Gigabit Ethernet is capable of delivering. The printer's included drivers support Windows 2000, XP, and Vista, as well as Mac OS X. The printer's standby noise level is 35 dB and operates at 50 dB when printing. It also consumes 5W of power at standby and a maximum of 140W when working. The printer's Mac OS X support is limited, as it lacks Adobe PostScript support out of the box. Users in need of support from Adobe Illustrator, QuarkXPress or other PostScript-driven applications will need to use a RIP package compatible with this printer. Review it: "Canon imagePROGRAF iPF750 "
The printer ships with six starter ink tanks featuring lower capacities than replacement cartridges. Consumables for this printer include five ink tanks for matte black, black, cyan, magenta, and yellow, as well as print heads to be replaced when near clogging and a maintenance cartridge that must be replaced in order to dispose of excess waste ink. Unlike consumer printers or office printers, high-end inkjets' ink is measured solely in milliliters, as the number of pages produced varies based on the quality of prints, how large sheets are, and what colors make up an individual print. This combination of factors makes it almost impossible to accurately gauge the number of sheets produced by a single tank of ink.